I’m in San Sebastián, Spain, but I could really be anywhere. I’ve flown halfway across the world, but from inside this coffee shop, I can’t tell what country I’m in. They say that travel allows you to see different ways of living, but that’s definitely not what I’m doing. As I drink this latte, I might as well be back in New York. All around, I’m struck by disappearing diversity. The world is becoming optimized for the dominant aesthetic of the internet. I swear: every trendy, optimized-for-algorithms place has the same lights, the same chairs, and the same damn avocado toast. In some way, generic styles are nothing new. Hotel brands promise a consistent, yet sterile, customer experience no matter where you are. Walk into a Hilton or a Holiday Inn and you know what you’re going to get. The clerk at the check-in counter will speak English and there will be a rotating waffle maker at the continental breakfast. Airports and shopping malls are similarly predictable. The issue is this: hotel visitors know they’re getting something generic. That’s the point. Mid-tier hotels advertise safety and reliability. They sell risk minimization, not experience maximization. Algorithms, though, advertise authenticity while selling commodities. Algorithms trick us into thinking we’re getting real and authentic experiences, when in fact, we’re getting the opposite. In the internet age, feedback loops move quickly between the real world, Instagram and back again. Once-hidden restaurants, featured on Anthony Bourdain's Parts Unknown, are now well-known and commercialized. Retail stores and sightseeing tours are impacted as much as restaurants. Ready-to-purchase, authentic experiences only exist for a short time. This drives an eternal commercial loop: At first, authentic travel experiences such as tours and cooking classes are too expensive to buy. As they gain popularity, they become standardized and mass-produced. As their price drops and these experiences lose their authenticity, artisans arrive with niche, personality-driven products, which kickstarts this commercial loop all over again. As I reflect on recent trips to Spain, Australia, and Mexico, I can’t help but think how little the best parts of travel have been changed by technology. In fact, the best parts of travel are precisely the things that technology cannot touch. Distinct, foreign experiences in cities — which evolve around people —cannot be bought or sold.¹ They can’t be found in guidebooks and you’ll find no reviews on Yelp. More, as I scroll down these algorithmic websites, I find bland experience after bland experience. When we rely too much on algorithms, we travel around the world and end up with the same experiences we’d find in our backyard. To be sure, authentic experiences don’t have to be scarce. The participation of others doesn’t necessarily dilute an experience. In fact, large groups can enhance an experience. Certain elements of culture come out only in the context of large groups. For example, no matter where I am, I always try to attend a sporting event. Sports are an excellent window into another culture. 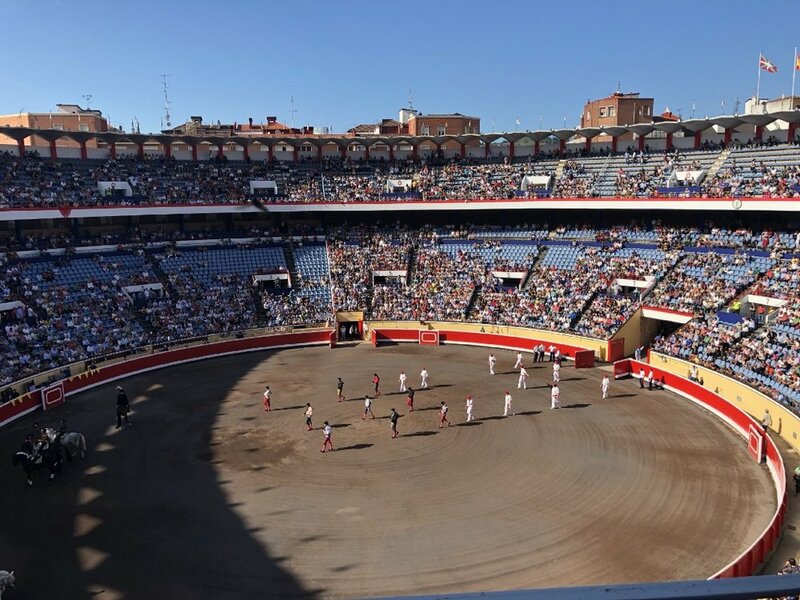 In Spain, I attended a bullfight. In Australia, a cricket match. I shared both experiences with thousands of people. I also recommend festivals, street fairs, and local food markets. The higher the ratio of locals to tourists, the better. Unfortunately, algorithms discourage this kind of culturally rich travel. In turn, they destroy difference and encourage similarly — a “globalized sameness-as-a-service.” As our bodies hop from country to country, our headspace never changes. I worry that we’re going places without actually going at all. Cities are increasingly filled with “AirSpace” style spaces — defined by rustic interiors, sans-serif logos and refurbished industrial lighting — that could easily be in anywhere in the world. They look glamorous but feel empty. The phenomenon now extends beyond hotels and restaurants. “Things to Do” such as tours and excursions — geared towards the incentives of algorithms — have met the same fate. By disconnecting from its geography and making everything as average as possible, AirSpace is the antithesis of travel. I see travel as a method of learning. It’s an investment. I rarely travel for leisure, recreation or relaxation. I understand why people do it, but at this time in my life, that’s not where my priorities lie. Planning and paying for travel is a big investment in energy, money and time. The opportunity cost of travel is large, so the long- term returns must be worth it. Besides, it’s cheaper and more convenient to have fun in my home town. "I think going to Beijing and seeing the Summer Palace, and then going to Tokyo and seeing some shrine and whatever, is basically useless because you don’t really get more than you would get by going to Wikipedia. But I think the kind of traveling that is valuable is the kind where it’s not even set up as explicit travel for the sake of travel. You’re traveling there in order to do something, and in the course of doing that, you end up interacting with people. You end up seeing what the different aspects of the culture look like. You end up seeing how people think, how people interact with each other. Is there something that they’re doing that’s better than what you’re used to? Are there things they’re doing that you can really say are worse than what you’re used to? In summary, if you want to learn about the Eiffel Tower or the Golden Gate Bridge, it may be better to pick up your smartphone, open up Wikipedia, and save yourself the expense. There’s one problem with this strategy: this kind of travel doesn’t scale. It’s inefficient and doesn’t conform to the 80/20 rule. It’s unpredictable and things could go wrong. Travel — when done right — is challenging. Like all face-to-face interaction, it’s inefficient. The fact that an experience can’t be found in a guidebook is precisely what makes it so special. Sure, a little tip helps — go here, go there; eat here, eat there; stay here, stay there — but at the end of the day, the great pleasures of travel are precisely what you can’t find on Yelp. Here in San Sebastián, the best pintxo bars are the dirtiest ones. They have tons of napkins on the ground. The more napkins, the better the food. Locals depend on this unspoken rule-of-thumb. A floor full of napkins signifies tasty, local food but a terrible Yelp review. In New York, where I live, the issue is most acute with speakeasies. Traditionally, these once-secret-bars could only be discovered through word-of-mouth. They were hidden in basements and behind secret doors. On the internet, speakeasies receive prime algorithmic real-estate. They are no longer secret. With such prime visibility, they might as well be located in the middle of Times Square. Strikingly, the same traits that would have made a place obscure in the 1980s make it a popular, line-out-the-door draw in 2018. In contrast, this tip-top-rated, hyper-perfect coffee shop is sterile. It has no personality. There’s nothing local about it and the food Instagrams better than it tastes. Optimized for algorithms, it rewards cleanliness at the expense of interestingness. Drop somebody in here and they won’t know if they’re in Shanghai, San Francisco or San Sebastián — the opposite of what you want as a traveler. And yet, this coffee shop is packed. Here, you’ll find nothing but trend-hungry foreigners in search of familiarity and a neon-lit stage for their next Instagram post. When we follow algorithms, we simultaneously increase the likelihood of a good experience while decreasing the potential for a great one. It’s a trap. Trust algorithms too much and you’ll find that you’ve been somewhere without ever having actually been there. Travel should be driven by curiosity, wonder and serendipity. Fueled by the energy of excitement and spontaneity, the best travel experiences can exist only once at a single moment in time. When I speak with locals, I’m blown away by the unexpectedness of what I see and learn about their philosophy of life. Each one has a different way of interacting with their hometown. Their stories always surprise me. Better yet, their recommendations are always interesting. Each place, from Sydney to Mexico City, is much more different than what mass-produced experiences would lead you to believe. As you escape the restrictive world of algorithms and journey to the expansive world of human interaction, this reality will hit you like a freight train. What have I learned about traveling in the internet age? Traveling in cities is like a trip to the Louvre. Algorithms will recommend the Mona Lisa. It’s the best and most famous painting there. “You can’t miss it.” Here’s the problem: According to the director of the Louvre, 80% of the visitors are there just to see the Mona Lisa. Many visitors ignore the other world-class paintings right down the hall. With the right guide, these other paintings are equally rich and more enjoyable to see. I’m definitely not against using the internet.⁴ I simply try to avoid algorithms — especially for restaurants and travel tours. For restaurants, I always ask for recommendations and follow the fail-proof guide of passionate responses.⁵ If someone’s face lights up as they describe a restaurant, go there. If it’s an experience, do it. It’s impossible to appreciate the depth of another culture without activating all five senses —hear, see, smell, taste, and touch. I want memorable experiences but know they cannot be forced. I want a reliable, easy-to-execute system but know that such a system will destroy the very serendipity that gives travel its flavor. Nevertheless, I can’t help but create a system. It’s what I do. Ultimately, my philosophy of travel boils down to this: When possible, avoid algorithms. Meet passionate locals who can communicate their passions well. Then, follow their lead.⁷ Do what they do, go where they go, and ask lots and lots of questions. If you find yourself saying “that’s weird” then you know you’re in the right place. ¹ There are exceptions to this. But mostly at high price points. Sky-diving and high-end dining are exhilarating and likely to be recommended by an algorithm. Parts Unknown is a striking example of how algorithms shape real-world geography. On Season 8, Anthony Bourdain and Barack Obama slurped noodles together in Hanoi, Vietnam. Before the episode, the restaurant was just a local spot. It was not a popular tourist destination. Now, that's changed. The restaurant (called Bún Chả Hương Liên) has a museum-like table inside a glass structure to commemorate Bourdain's meal with Obama. Thanks to Web Barr for this excellent observation. ² In Mexico City, a colleague recommended her favorite high-end restaurant, where I dined at alone. The reviews were good, not great. A recommendation from a friend was the exact push I needed to walk into a crowded, high-end restaurant. “Table for one, please.” Fueled by personal recommendation, this was no time to be timid. I walked to my seat with a big, confident smile on my face and sat down. It was time for serendipity. Seconds after I sat down, I struck up a long conversation with the waiter who ignored protocol and gave me a one-on-one masterclass in the tortilla textures and the complexities of salsa. After building rapport with him, I asked him to order his favorite foods on my behalf. The meal he delivered tasted better than anything I would have found on Yelp. ³ In Sydney, Australia I met a food writer named Jono who took a few days off work to take me to his favorite local restaurants. Jono’s recommendations would have flopped on Yelp. I would have never found them on my own. Jono took me to a coffee shop made of recycled shipping containers and a hole-in-the-wall Thai restaurant which bordered a large row of projects that my intuitive compass would have avoided. And yet, the experience of being led by a local is unquenchable. The best insights from traveling come from the window they hold into their life and the mirror they hold onto yours. No matter where I am, I seek local connection. ⁴ In particular, I love one-person blogs. All my travels begin with a search on Marginal Revolution, a blog written by Tyler Cowen and Alex Tabarrok. I read through the posts that relate to where I’m visiting. If if I find a local blog I like, I always reach out to the writer for lunch or personal recommendations. ⁵ Once again, these rules don’t apply for high-end restaurants. These are general rules but since the world is so vast, there are always exceptions. ⁷ Safety obviously matters here. Be smart. But remember, safety and comfort are very different. Seek discomfort and don’t conflate the two. Thanks to Zander Nethercutt, Drew Austin, Alex Hardy, and Web Barr for their feedback on this post.